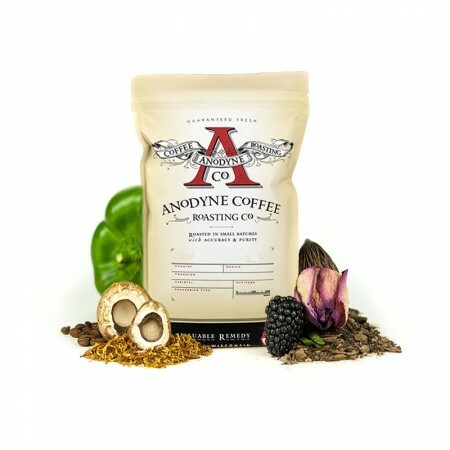 This is the Dark Roast Sumatra Takengon Jagong brought to you by Anodyne Coffee Roasting Co. This Organic certified coffee was sourced from the growing region of Aceh in Sumatra and was produced by the Jagong Mill. While labeled a dark roast, this coffee is a bold, full bodied medium roast with intense earthy, dark chocolate, baking spice and herbal notes. Full of flavor. Rich and bold. My favorite so far. A bit too powerful a flavor for the wife though. One of the best coffees we’ve ever had. Wonderful! Love the dark chocolate notes! Very acidic and full bodied. Tasting notes were almost overpowered by the acidity. Enjoyed as an espresso, not the favorite as a pourover. Not a fan of the bourbon type flavor. did not love this one. Some interesting flavors but dominated by earthy, bordering on muddy flavor to me. A little too much acidity for my taste. Realizing I really just prefer a darker roast than this. Complex, earthy flavors. I was hesitant to try brewing with less coffee for longer but works very well and retains a good body. Awesome coffee. Nothing shocking in terms of flavor/notes, which isn't a bad thing. Robust. Makes a great cup. as good a sumatra as I have had; more subtle than the norm. this is thankfully not really a dark roast and is thus more flowery and herbal than the norm. I use the aeropress in inverted position for this coffee; chemex ground more or less; and ratio 12 to 1; water to grinds. could even go up to 14 to 1 for a bit less intensity. A little too dark/bitter for me, I think. I used to love the really dark ones, but since I started mainly using chemex (and sometimes french press) I seem to like medium roasts better. This was better when I added some milk, but I didn't love it black. Probably would have been better as a drip coffee, though. Realizing I don't like dark roast. Just too dark for me. This is a solid dark coffee, very smooth and earthy. I had a more difficult time discerning the more subtle notes, maybe because it is a darker roast. But I really enjoyed it. Dark Roast. mixed really well with the almond milk we use. Great coffee - expected earthy flavor typical of Sumatra. I did not like this coffee tasted really bitter and was not sure how to make it. The aroma was amazing, but I wanted a bit more body out of this coffee to really complete the package. Seemed over-roasted. Beans were fairly brittle. too dark / burnt. Did not enjoy. I like the bold, earthy flavor, with notes of dark chocolate, baking spices, and some smokiness. This is good and intense. Perhaps a little too strong on the spice (clove?) notes, so it is not something I'd drink daily forever, but it is nice for a once in a while strong coffee! This coffee took me by surprise, I went into it thinking I would think it would only be ok because I usually drink a light roast. This is a bold coffee with a very smokey flavor that hits you right off, not too bitter or overpowering. Just the right amount for a very strong understated flavor. I made it in a Chemex, French Press, and as Espresso and found it to have a consistently delicious flavor profile across each of these methods. This coffee is Fantastic. When I think of a cup of coffee i think of something dark and earthy, slightly biter but not too bitter, and with good amount of flavor. And this coffee nails it. It has a brown sugar earthy flavor to start and then finishes with a nice fruity flavor. I do wish though that it had more of a chocolate flavor.